Do you want to become a better producer and mixer? Learn 1-on-1 from an industry professional. Whether for pleasure or to attract an audience and tour the globe – creating music is fun. Learning how to make music, however, is not. It can be frustrating to go through all of the online content – the videos, the articles, the conflicting advice – and not find the answers you are looking for. Take a short cut – learn how to do exactly what you want from an industry certified professional. 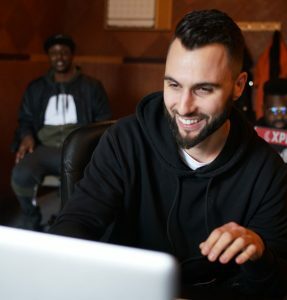 Lessons are taught by 5PiECE – whose formal education began at the Metalworks Institute where he earned a diploma in Audio Production and Engineering, and led into an internship with Noah “40” Shebib at OVO Sound and expanded into working experiences at studios across Toronto. Music is a piece of intellectual property that can generate income for its creators and people who help create the work. If you’re an aspiring artist, producer or engineer, hoping to generate a full-time income from releasing music, or offering production and engineering services, lessons will help you create a better product that will lead to more fans and artists wanting to spend their money on what you do. A few hours spent learning in-studio could add thousands or even millions to your annual income. 5PiECE graduated from the Metalworks Institute of Sound & Music Production in 2013 with a diploma with honours in Audio Production & Engineering. Upon graduating, he interned for Drake’s record label OVO Sound, mentoring under his main producer Noah “40” Shebib at their SOTA Studios Facility. He later moved on to engineer at several full-scale facilities in Toronto such as DNA Recording Facility, Vespa Music Group and New Toronto Studios before setting up his own private studio and music company. Throughout his travels, 5PiECE has worked alongside notable talent such as Sean Paul, MADEINTYO, 24HRS, !llmind, MurdaBeatz, WondaGurl and many more. 5PiECE is familiar with most popular DAWs and prefers to produce in Ableton and mix in Pro Tools. What can I expect from a lesson with 5PiECE? 10+ years of experience condensed into 2 hours – with the ability to save you lots of time, headaches and frustration. Reach out below to determine lesson availability and scheduling. Once confirmed and agreed upon, send deposit for lesson via E-Transfer or PayPal to reserve your lesson time. Day of lesson – be attentive, take notes, ask questions and get feedback on your work. Pay balance of lesson. Who are these lessons good for? Producers, beat makers, artists and aspiring engineers who want to improve their producing, mixing and mastering skills when it comes to creating and releasing music. What’s included in the lesson? Lessons include the instructor and private studio facility with professional equipment for the lesson. Lessons also include a screen-capture video recording with audio of the lesson so students may refer to it again later. Why do you include a screen capture recording of the lesson? Having a copy of the lesson in this format gives you a way to revisit the lesson and ensures that you learn exactly what you came to learn from 5PiECE. What DAWs do you teach lessons in? Mixing lessons are taught in Pro Tools or Ableton based on student preference. Production lessons are taught in Ableton exclusively. Do I need Pro Tools or Ableton for lessons? For mixing lessons, no, the principles taught in lessons are not specific to any DAW- they are mixing techniques you can use within any DAW environment including but not limited to FL Studio, Logic, Reason, Reaper, Cubase, etc. Past students have been on FL Studio and Logic. For production lessons, it is recommended that you have and produce in Ableton as lessons are taught in that environment. Lessons are 2 hours long. Classes are customized to each student. For beginner production lessons, we have developed a proprietary curriculum that teaches you the fundamental elements of music production and how to approach applying it in real-life creative situations. This curriculum is stretched over multiple lessons that cover topics such as sound selection, drum programming, melody, arrangement and final mixing/mastering and more. For mixing/mastering lessons, students often arrive with a personal song/beat they want to focus on mixing and mastering. This song is mixed in front of them while the decisions and thought-processes behind the mix decisions are explained by the instructor. This helps the student understand what is being done and why its being done so that the student can leave with an example of how to apply the knowledge within their own work. Students are also able to ask questions or for specific demonstrations during the lesson as well. Are lessons good for beginners? Classes are good for anyone of any skill level whether you’re just starting to make music or have been making music for awhile and want to hone your skills. I’ve taught students of all levels. Are lessons done in-person or online? Where is the studio for in-person lessons? The studio is located in South Etobicoke in Toronto near Kipling Avenue & Horner Avenue. Also close by Lakeshore, 5 mins from Humber College South Campus. Once your booking is confirmed, you will be sent the exact location. Can I bring someone with me to a lesson? While we respect that your friends and family are your biggest supporters, other parties usually interfere with lessons by creating interruptions, noise, distractions, etc. We want your learning to be our focus so that you can become the best producer and engineer you can be. For that reason, we ask that only students show up to attend lessons. Can you come to my home/studio to teach a lesson? Unfortunately at-home lessons are not offered at this time. All lessons are offered in-person at my studio location or online. Lesson payment can be made via Interac E-Transfer if you’re in Canada, or PayPal if you’re outside of Canada. All PayPal payments are subject to an additional 4% fee for processing. Please refer below for a breakdown of our lesson pricing. Pay upfront for multiple lessons and enjoy a reduced rate.